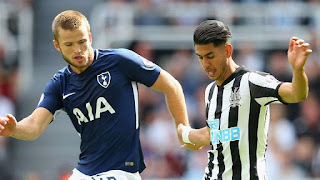 Newcastle faces Tottenham in Premier League season 2018-19 at St James' Park, Newcastle. Both clubs start the new season in far from ideal situations with the Magpies having endured another frustrating summer transfer window under Mike Ashley’s ownership on Tyneside. Spurs start their campaign with a host of first-team players not fit in the eyes of manager Mauricio Pochettino, having returned to training late following their post-World Cup breaks. Harry Kane and Dele Alli both start for Spurs despite returning from their post-World Cup holiday at the start of the week, with the Magpies have summer signing Kennedy back in their ranks after joining for a second season-long loan. Tottenham line up: Lloris (C), Aurier, Sanchez, Vertonghen, Davies, Dier, Sissoko, Eriksen, Dele, Lucas, Kane. No Comment to " Newcastle vs Tottenham LIVE: Premier League "